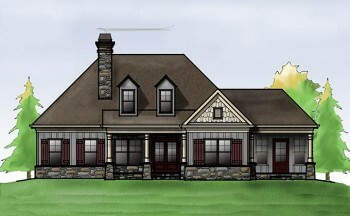 Blandenburg Bungalow is a craftsman bungalow style house plan with a two car garage. A creative mixture of oversized gables, shake, stone and vertical siding make the craftsman style details on this exterior one to remember. The dining room, kitchen and family room are open to each other creating an open feel and allowing you to easily communicate within the house. The master suite is separated from the rest of the rooms adding a sense of privacy. A two car garage has easy access to the master suite or kitchen for unloading groceries. On the upper level you will find three bedrooms and a bonus room to relax, watch tv and play games.